The MetroLAN1000 transports up to 8 E1/T1 and up to 8 Ethernet 10/100BaseT services over a fibre based STM-1/OC-3 service or a dark fibre (e.g. a private fibre connection). The MetroLAN1000 can be used for carrier service delivery offering product delivering multiple E1 and fast Ethernet services over an SDH network. Using fibre optics the MetroLAN1000 products extend the operating distance for a E1 2Mbps G.703 interface to 5km using multimode fibre, or to either 30km or 70km using singlemode fibre. Despite these quoted maximum operating distances for the MetroLAN products, specific installations may only operate over lower distances due to the variations in losses of different types of fibre cable, the use of connecting fibre cables, or patch panels. When operating over 50% of the maximum distances it is advisable to calculate all fibre optic connector and cable losses and compare these with the fibre optic loss budget specified for this product. The MetroLAN1000 presents 8 LAN ports which are fully auto-sensing 10/100BaseT interfaces with manual override (e.g. 100M full duplex when connecting to Cisco routers), thereby supporting any LAN network infrastructure. 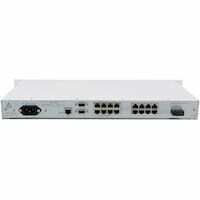 These 8 independent LAN interfaces are separately allocated bandwidth and so there is no contention to worry about. Each of these LAN connections is transported to a remote location via the SDH/Sonet infrastructure. Generic Framing Procedure (GFP) encapsulation along with virtual concatenation (VCAT) with VC4, VC3 or VC12 granularity and LCAS support offers maximum benefit to both service providers and users in terms of flexibility and bandwidth optimisation. The MetroLAN1000 supports 8 independent GFP sessions, each of which may be directed to separate remote destinations. The MetroLAN1000 supports IEEE 802.3x flow control on all 10/100 ports to prevent traffic loss when reduced bandwidth is available. Full wire speed forwarding on any GFP session requires 50 VC12 tributaries. The remaining bandwidth is available to other GFP sessions enabling the full 155Mbps to be utilised. The MetroLAN1000 supports large frames of up to 4096 bytes and is protocol and payload transparent. The MetroLAN1000 will pass VLAN tagged frames, including "Q in Q" double tagged frames and CISCO ISL, transparently end to end. To further optimise network utilisation the MetroLAN1000 offers 8 E1/T1 G.703 clear channel port, which are suitable for the transmission of both structured and unstructured data, such as G.704, ISDN PRI. Each E1/T1 may be mapped into an individual VC12 for mapping within the remaining Sonet payload. The management of the MetroLAN1000 is either local via the console port or remote via the Ethernet management port using SNMP or Telnet, or via a data link within the SDH/Sonet overhead channel. Both console and Telnet access methods are password protected, whilst SNMP offer security via community naming. Comprehensive performance statistics are available for all ports. Access via the overhead data link is offered for integration into standard network management schemes. 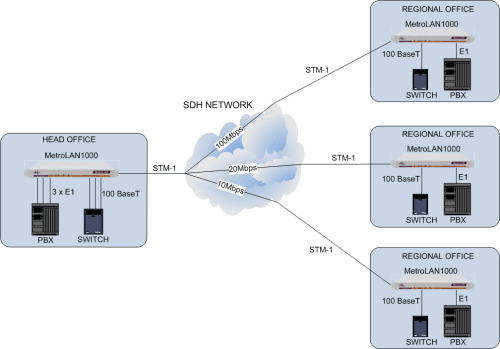 SNMP Version 1 is supported, including MIB2 and traps. SNMP traps will be generated based on alarms for any of the network or user ports. TFTP download of software and configuration data is supported as a means of future-proofing this product. A pair of changeover relays indicate alarm conditions arising on the MetroLAN1000. The major alarm relay is energised for normal operation to ensure that a fault is signalled in the event of power failure. The integral PSU is fully auto-sensing from 100 to 250 VAC, and -48VDC powered versions are also available. This application shows three remote offices connected to a head office. Each site is equipped with a MetroLAN1000 that is connected via an OC-3 link to the carrier Sonet network. The head office requires a full OC-3 connection, whilst the remote office sites require only fractional OC-3 connections. Since the bandwidth requirements between the head and regional offices are high, a GFP session is configured to use 100Mbps by concatenating 48 VC12 tributaries. A further 10 VC12's are directed to the larger branch office giving 20Mbps bandwidth, whilst 5 VC12's are directed to the smaller office giving a 10Mbps connection. In this way each of the different sites has guaranteed uncontested bandwidth between each application and between every site.